A life lesson that all parents want their children to learn: It’s OK to make a mistake. In fact, hooray for mistakes! A mistake is an adventure in creativity, a portal of discovery. A spill doesn’t ruin a drawing—not when it becomes the shape of a goofy animal. And an accidental tear in your paper? 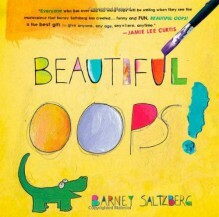 Don’t be upset about it when you can turn it into the roaring mouth of an alligator.Barney Saltzberg, the effervescent spirit behind Good Egg, offers a one-of-a-kind interactive book that shows young readers how every mistake is an opportunity to make something beautiful. A singular work of imagination, creativity, and paper engineering, Beautiful Oops! is filled with pop-ups, lift-the-flaps, tears, holes, overlays, bends, smudges, and even an accordion “telescope”—each demonstrating the magical transformation from blunder to wonder.The smudge becomes the face of a bunny, a crumpled ball of paper turns into a lamb’s fleecy coat—celebrate the oops in life. http://CherylAnnieDoucette.booklikes.com Learning on the Fly 4.0 Beautiful Oops! Love that mistakes can take you places!